The end of an era: September 1992. 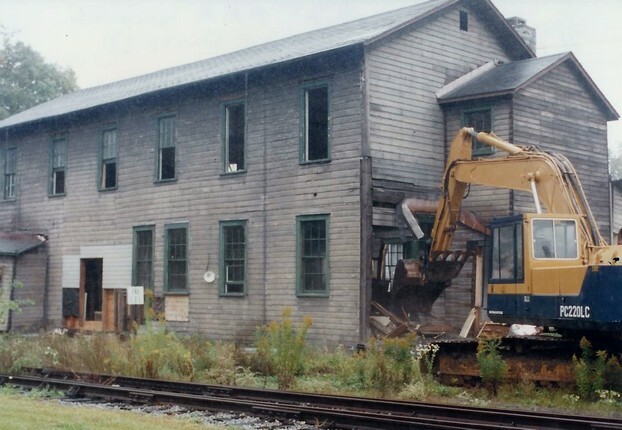 This picture shows the demolition of the Pennsylvania Rail Road bunk house that also housed the restaurant Railroad Y. 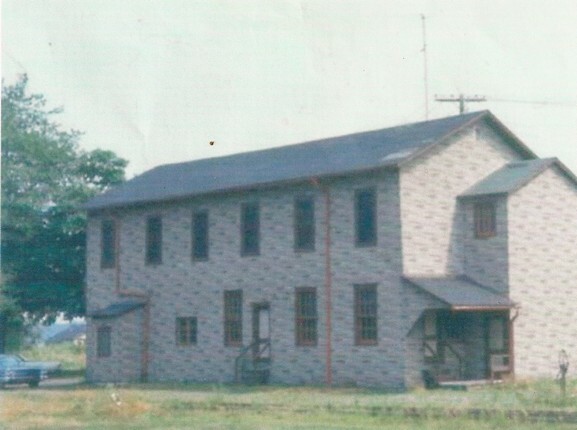 The bunk house in an earlier time. It was located next to the Franklin House on Sentell Street. First floor: On the left side was the office; middle was the Railroad Y restaurant; right side was a recreation area for the railroad workers. Second floor was the bunk beds for the workers. Photo courtesy of Henry Zerbe. When I interview the “old timers” of Sodus Point and the subject of the Railroad Y comes up, they speak in hushed, almost reverent tones like a loved one who has passed away. Such was the affect that this humble, unassuming establishment had on many people who lived in Sodus Point in the 1940s and 50s. Another vivid memory was walking up past the malthouse and customs house to the rail yard’s restaurant (This restaurant was called the “Railroad Y”). It was in an unmarked and unpainted two story building that was pretty much the color of coal dust. If you were not local, you would never know that it was there because the trade was mostly walk-in from the train crews, Inside it had green and somewhat white/gray linoleum flooring that had seen better days. The lunch and dinner counter could handle the train crews that worked around the clock. The crews would come in literally covered in dust to grab some of the great wholesome homemade food that was prepared by local ladies who worked as the cooks. It was the best and the prices were dirt cheap. The seasonal apple and berry pies could not be beat anywhere. Some of the ladies who cooked even sold custom embroidered pillow cases for $1 or $2 depending upon how fancy you wanted the design. When you walked in regardless of the hour, it always felt like going home. The Railroad Y was a small restaurant (about the size of a normal sized living room) located on the first floor and in the middle of the railroad bunk house. There was not a sign on the outside so usually only the railroad workers or local residents knew about it. It consisted of a counter and a few tables. People normally ate at the counter and rarely used the tables. It was open 24 hours a day during the high season and closed during the winter due to very few railroad workers being there. Emma Hill, Ruth Buzzell and Stuart Balch’s mother and 2 sisters were some of the cooks. He remembers Stu Sill and a policeman being regular customers along with the railroad workers. One problem that the railroad workers sometimes ran into was the occasional people from out of town who would stop in to hear stories from the railroad workers. This was a problem because if you were working for the railroad and only worked 4 hours that day, you only had 20 minutes to eat and that left no time for talking. If you were working 6 hours or longer you had 40 minutes and could do it. The Railroad Y has come and gone but like deceased loved ones, its memory lives on.